This was a brand new block for me in March 2016 (I had never taught it nor any version of it). I was unable to finish the block at that time due to a family emergency. So now we are returning to it. I have some notes from before -- and I so love having this website because I can quickly and easily organize and then later find all of my notes and links --- but still need to plan out the remainder. These are my notes as I go along. If you have suggestions, please contact me! We are using the highly-recommended The World of Walls: The Middle Ages in Western Europe by Polly Schoyer Brooks and Nancy Zinsser Walworth. Leah had already read The Arabs In The Golden Age and Genghis Khan and the Mongol Horde before we began this block. 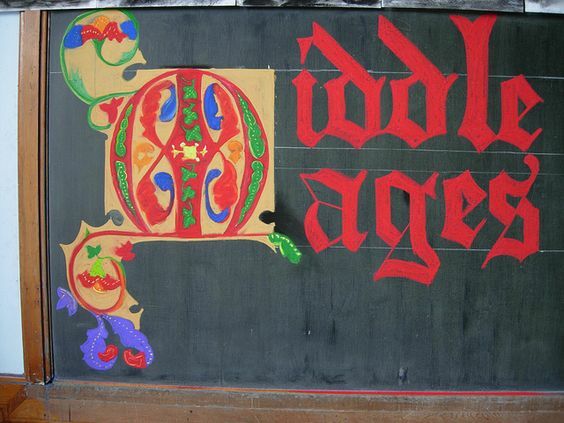 I based my introductory chalkboard drawing on this one: "The 3-Fold Society of the Middle Ages"
My curated collection of visuals! Browse sample main lesson book pages, watercolor paintings, chalkboard drawings, etc. for Middle Ages. Story #1 "The Fall of Rome / The Barbarian Invasion"
Story #3 "The Feudal System"
Story #5 "The End of the Dark Ages"
Didn't find this book until after the block was done, but I would love to use it next time!!! It ended up that I combined a discussion of King Richard with King John in story #10. King Richard did not get his own MLB page. So, I went from Eleanor on to Francis, then back to both of Eleanor's sons and what became of them. Magic Wool: Creative Pictures and Tableaux with Natural Sheep's Wool contains instructions for making a flat wool picture of St. Francis preaching to the birds (figure 27). (born 1343) to finish off our block but did not add it to our main lesson books. Check your public library for an audio CD of Chaucer's Canterbury Tales read in the original Middle English. It's almost impossible for students to understand that English used to be different unless they hear it for themselves! It was fun for us to listen to this while having our culminating Medieval Feast before leaving for Winter Break. Look for a stained glass workshop near you, or find an opportunity to learn or practice woodworking, leather working, or metalworking. *NEW* Magic in the Middle Ages free online class offered by the University of Barcelona (in English). For parent background or just for fun! "These lessons cover the type of Latin used in official documents written in England between 1086 and 1733. This can be quite different from classical Latin, as used by the Ancient Romans." Great for a homeschool co-cop group activity! "Free on-line heraldry game - learn about Shields, Knights and Heraldry. Role-play as a young aristocrat, recognizing friends and enemies." This looks interesting so I am including it, but it might only be useful to a very few people.